Building and publishing a website is very easy and can be done within minutes. If you are blogger using a free blogging platform like blogger or WordPress. Then, this article would be of immense help to you. Buying the domain name and hosting account. The first major task of building a website is choosing your domain name. Domain name is like a foundation for a home. Half the battle is won when we choose the right domain name. The domain name should be easily memorable: This helps in getting word-of-mouth website traffic. The domain name should be short and not more than 15 letters: The longer your domain name, greater it will be prone to typo errors. It should not have repeating letters. It should relate to your website niche. The domain name should be unique. Now that when you have decided upon the domain name (taking the above five factors into consideration). The next step is to buy your domain name and hosting account. To buy your domain name head over to FatCow Hosting (discounted link), where you can get a 12 month hosting with a free domain name for $45. Now, after heading over to the above mentioned link of FatCow hosting choose the sign-up option. After choosing the sign-up option you will be re-directed to select your domain name. In this step choose the option to register a new domain name and type in the domain name you want. Now if your domain name is available, you will be able to see the sign-up page, where you will be asked to fill up your contact and payment information. There is no difference between the above three plans other than plan-duration and per-month cost. Choose the plan which you can afford. The next thing you need to understand in the purchase information is Domain Privacy. Generally according to ICANN rules when you buy a domain name your contact information will be publicly accessible. If you don’t want your contact information to be accessible to public then you can choose this domain privacy option which costs you around $9.99/year. 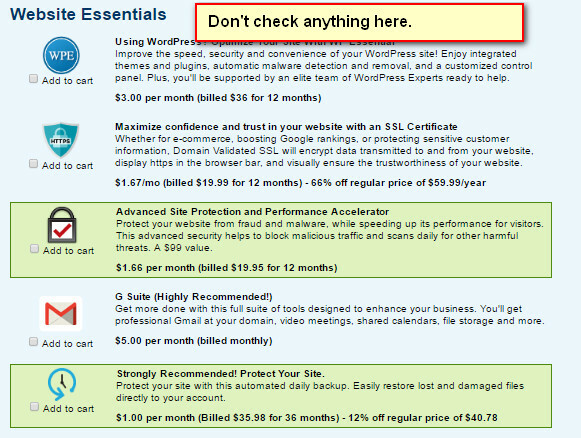 The next section is Website Essentials, don’t check anything here since these are unnecessary. Remove the check mark for any option checked in this section. After completing the above steps, now choose the check out option and complete the payment process. 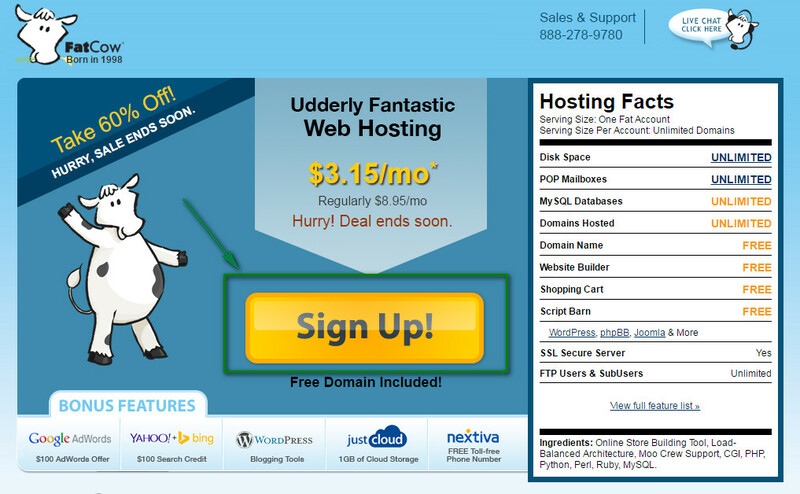 Congratulations, now you have got your own domain name and hosting account through FatCow.